Thanks to author Peter Schranz for stopping by and sharing an interesting essay on science fiction writer, Mark Twain! Having visited Twain’s boyhood home this summer, I wonder what Samuel Clemens would think of it? 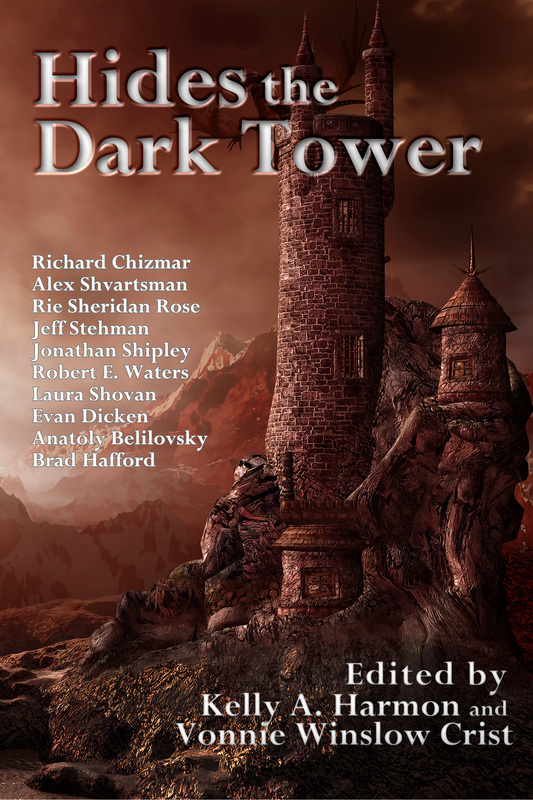 For those who haven’t ordered their copy of Hides the Dark Tower containing Peter’s story, “Tower of the Sea Witch,” here’s the link. Now, back to the essay. Enjoy! ‘It’s not news that science fiction writers are good at making uncanny predictions about future technological advancements: Verne’s 1865 novel From the Earth to the Moon developed Apollo 11, Wells’ 1903 story The Land Ironclads triggered World War I, and Shelley’s 1818 novel Frankenstein gave birth to the misunderstood English corpses responsible for the gothic rock music of the early 1980s. What a slice of pie it would be if I could justify the argument that I belong on the list because of ‘Tower of the Sea Witch,’ my contribution to Hides the Dark Tower, but unfortunately that story is set before technological advancement was even invented. I would say that the list, long as it is, has snubbed Mark Twain, one of my country’s greatest science fiction writers. You might not think he’s a science fiction writer, but I intend in this paper to pry that false notion right out of your brain forever. A French translation of part of “The Celebrated Jumping Frog of Calaveras County,” appeared in the Revue Des Deux Mondes of July 15, 1872. Three years later, Twain discovered the article, took exception to its note that his story wasn’t that funny, and re-translated it back into English to reveal that the French translation was a disjointed shadow of the original, mainly via his feigned and smart-alecky ignorance that French and English syntax and grammar significantly differ. While the idea of machine translation dates back many centuries, the first actual machine to translate wasn’t available until about fifty years ago. This means that Twain predicted the translation method made famous by machine translators (‘letter-not-spirit method’) by a good nine decades. O Roméo, Roméo ! C’est pourquoi es-tu Roméo? O Romeo, Romeo! This is why are you Romeo? In fairness to the translation in the Revue Des Deux Mondes, its French (I’m so magnanimous as to presume) is without fault, a feat, considering Twain’s ample colloquialisms (which I guess is the joke), whereas the French in Shakespeare’s and Poe’s machine translations looks about as bad as the re-English. But this eerily similar, slavish adherence to the “from” language’s syntax (cf. 1875’s “Never you not have seen frog as modest” and 2015’s “This is why are you Romeo?”) and the refusal to translate certain words (cf. “Tenez, I him have seen pose Daniel Webster there upon this plank” and “Loin dans l’ombre peering”) is what demands that I forward Mark Twain for consideration as a member of the technology-anticipators’ club. The mistakes he made in his translation and those that modern machine translators make are so similar that I can only assume Twain’s capacity for prediction was that of a science-fictionist’s. And here’s where you can find Peter’s books, Astonishing Tales of the Sea and It Spits You Out & 12 More Stories to Rub Your Chin To. After skimming this article, I discovered I hadn’t read all of the books mentioned, so I’ve added a few novels to my “To Read” list. Most of the books on the list I’ve read. I agree with the article’s authors – The Lord of the Rings, War of the Worlds, Dune, A Game of Thrones, The Hunger Games, Foundation, The Martian Chronicles, Harry Potter and the Philosopher’s Stone, The Left Hand of Darkness, The Hitchhiker’s Guide to the Galaxy, 20,000 Leagues Under the Sea, etc. have changed science fiction and fantasy, and added to the genre. There are other authors who’ve changed my perception of Science Fiction and Fantasy, but the writings of JRR Tolkien, Jules Verne, HG Wells, Ray Bradbury, Isaac Asimov, George RR Martin, Suzanne Collins, JK Rowling, Frank Herbert, Ursula K. LeGuin, Douglas Adams, and the other authors listed in this aricle stand out. By the way, the artwork featured in the post is nice, too. What do you think of 21 Books That Changed Science Fiction and Fantasy Forever? Were your favorites named?